Members of Jacksonville’s boards and commissions recently received an ethics refresher course from Carla Miller, the city’s ethics director. Miller, who has studied at Harvard on the subject of ethics, is an expert. 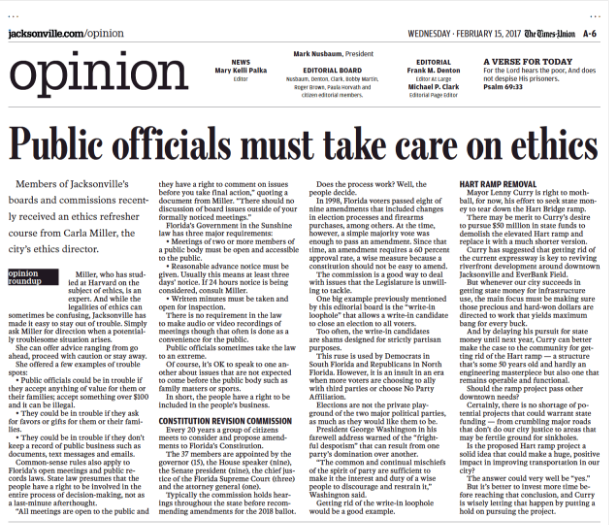 And while the legalities of ethics can sometimes be confusing, Jacksonville has made it easy to stay out of trouble. Simply ask Miller for direction when a potentially troublesome situation arises. She can offer advice ranging from go ahead, proceed with caution or stay away. Public officials could be in trouble if they accept anything of value for them or their families; accept something over $100 and it can be illegal. They could be in trouble if they ask for favors or gifts for them or their families. They could be in trouble if they don’t keep a record of public business such as documents, text messages and emails. Common-sense rules also apply to Florida’s open meetings and public records laws. State law presumes that the people have a right to be involved in the entire process of decision-making, not as a last-minute afterthought. Meetings of two or more members of a public body must be open and accessible to the public. Reasonable advance notice must be given. Usually this means at least three days’ notice. If 24 hours notice is being considered, consult Miller. Written minutes must be taken and open for inspection. There is no requirement in the law to make audio or video recordings of meetings though that often is done as a convenience for the public. Public officials sometimes take the law to an extreme. Of course, it’s OK to speak to one another about issues that are not expected to come before the public body such as family matters or sports. In short, the people have a right to be included in the people’s business.